Photo by Matt Lavin (CC BY-SA 2.0). Wormwood is a small perennial shrub with silver, feathery foliage that is native to temperate areas of Europe and Asia. Wormwood is used as an ingredient in the spirit Absinthe, traditionally it was thought to give it mild hallucinogenic properties but modern scientific testing has instead attributed any effect solely due to the high alcohol content of the drink. Wormwood has historically also been used to flavour mead and as an alternative to hops in beer. Traditional medicines throughout Asia and Europe use preparations of Wormwood to treat various ailments, cleanse harmful organisms from the body and stimulate digestion. Wormwood should not be consumed in large quantities as it contains the toxin thujone which can cause epilepsy and kidney failure. Compounds produced in the leaves of Wormwood can inhibits the growth of vegetables and especially herbs planted nearby so don't plant it where you grow your edibles. These chemicals are so potent that even rainfall can leech them out of the leaves on the plant transferring them to the soil below. If you wish to grow Wormwood it's best to plant it by itself or in garden beds containing established ornamental plants. Wormwood is said to repel a range of garden pests including slugs, beetles, ants, flies, mosquitos, caterpillars and mice. It may be useful as a barrier plant surrounding but well away from your edible plants to help repel some of these pests. 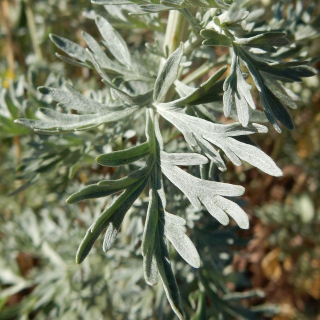 Wormwood should be grown in a location that receives full sun, the shoots will grow leggy and be prone to toppling over if it's grown in the shade. Don't overfertilise your Wormwood plants once they're established as this can also cause them to become leggy, you should only apply additional fertiliser if your plants show signs of a nutrient deficiency. Mulch around Wormwood plants well to keep their roots systems cool and suppress weeds. Wormwood is drought tolerant once established and grows well in drier soils, don't over-water it or it will put on weak growth and be prone to rot. Once established you can propagate additional Wormwood plants by taking 7cm long cuttings from hardened stems, avoid taking cuttings from fresh green growth as these will often wither and die. Prune back Wormwood plants at the beginning of Spring to maintain their shape. Wormwood prefers growing in soil with a slightly acidic to neutral pH between 6.3 and 7.2. In cold and mountains regions of Australia sow Wormwood seeds from September to November or from February to March. In temperate regions of Australia sow Wormwood from September to November or from February to April. In subtropical areas of Australia sow Wormwood seeds from August to October or from March to May. In the tropics sow Wormwood during the dry season, any time from April to August. Wormwood seeds are tiny so surface sow and cover them only with a very fine layer of soil to prevent them drying out. Thin plantings to 30cm apart to give your young Wormwood plants the room they need to grow. Most Wormwood seedlings will germinate 10 to 20 days after sowing the seeds. Wormwood shrubs take between 1 and 2 years to reach full size and start flowering.